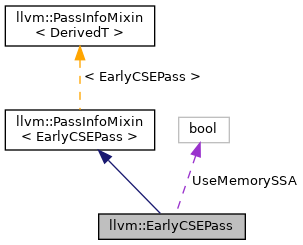 This pass does a simple depth-first walk over the dominator tree, eliminating trivially redundant instructions and using instsimplify to canonicalize things as it goes. It is intended to be fast and catch obvious cases so that instcombine and other passes are more effective. It is expected that a later pass of GVN will catch the interesting/hard cases. Definition at line 30 of file EarlyCSE.h. Definition at line 31 of file EarlyCSE.h. 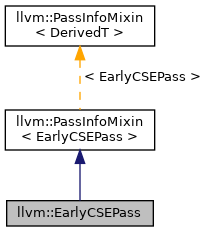 Definition at line 1264 of file EarlyCSE.cpp. References llvm::AnalysisUsage::addPreserved(), llvm::AnalysisUsage::addRequired(), llvm::PreservedAnalyses::all(), CSE, F(), llvm::Module::getDataLayout(), llvm::GlobalValue::getParent(), llvm::PassRegistry::getPassRegistry(), llvm::AnalysisManager< IRUnitT, ExtraArgTs >::getResult(), llvm::initializeEarlyCSELegacyPassPass(), llvm::initializeEarlyCSEMemSSALegacyPassPass(), llvm::PreservedAnalyses::preserve(), llvm::PreservedAnalyses::preserveSet(), runOnFunction(), and llvm::AnalysisUsage::setPreservesCFG(). Definition at line 36 of file EarlyCSE.h.